I’m a big fan of finches. They are easy to keep, and make wonderful companions with their song, and antics. You can enjoy their song, or sit and watch them for hours as they go about their business. This is even more enjoyable (for them as well), if the cage is large enough for some sort of flight, and they are not relegated to just hopping from perch to perch. That is where a large finch flight cage comes into play. 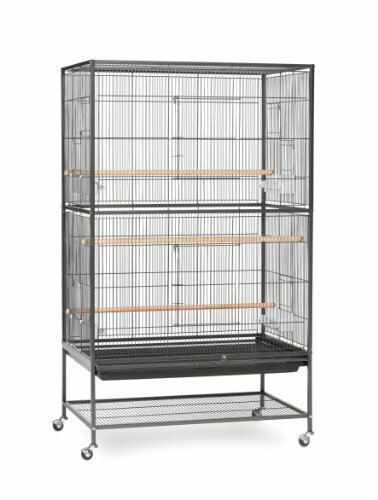 In my search for the perfect finch flight cage (for a reasonable price) I settled on the Prevue Hendryx Wrought Iron Flight Cage. I was not disappointed. I’ve ordered two more since my original purchase a few years ago, one as a gift for my parents and another to house the growing finch population in our household, currently comprised of strawberry finches, Gouldian finches, and European Goldfinches. The cage comes in two sizes, large and extra large. I have opted for the large just because of space constrains, otherwise, the extra large cage would make it a better small aviary for finches. It has a sturdy construction, which is not readily apparent during assembly, but once everything is in place, and all bolts are tightened, the cage leaves little to be desired. It comes in two color varieties, white and black (it has more of a hammered dark silver look than black). I personally prefer the black option because it tends to blend in better with outdoor placement, and provides a better viewing contrast. The flight cage also comes with 4 finch feeders, but no water dispensers. So you will need to add the water dispenser to your shopping list. The flight cage also comes with 3 wooden perches which have a nice girth, and make for a stable perching surface even if you are planning to use the cage for larger birds. This is a fantastic cage, especially for finches. I looked at many options both online and in stores, and this is by far the most bang you can get for your buck.